The ZX81 is a home computer that was produced by Sinclair Research and manufactured in Dundee, Scotland by Timex Corporation. It was launched in the United Kingdom in March 1981 as the successor to Sinclair's ZX80 and was designed to be a low-cost introduction to home computing for the general public. It was hugely successful, and more than 1.5 million units were sold before it was discontinued. The ZX81 found commercial success in many other countries, notably the United States where it was initially sold as the ZX-81. Timex manufactured and distributed it under licence and enjoyed a substantial but brief boom in sales. Timex later produced its own versions of the ZX81 for the US market: the Timex Sinclair 1000 and Timex Sinclair 1500. Unauthorized clones of the ZX81 were produced in several countries. The ZX81 was designed to be small, simple, and above all inexpensive, using as few components as possible to keep the cost down. Video output was to a television set rather than a dedicated monitor. Programs and data were loaded and saved onto compact audio cassettes. It had only four silicon chips and a mere 1 KB of memory. The machine had no power switch or any moving parts, with the exception of a VHF TV channel selector switch present on early "ZX81 USA" models and the Timex-Sinclair 1000, and it used a pressure-sensitive membrane keyboard for manual input. The ZX81's limitations prompted the emergence of a flourishing market in third-party peripherals to improve its capabilities. Such limitations, however, achieved Sinclair's objective of keeping the cost as low as possible. Its distinctive case and keyboard brought designer Rick Dickinson a Design Council award. The ZX81 could be bought by mail order in kit form or pre-assembled. It was the first inexpensive mass-market home computer that could be bought from high street stores, led by W. H. Smith and soon many other retailers. The ZX81 marked the point when computing in Britain became an activity for the general public rather than the preserve of businessmen and electronics hobbyists. It produced a huge community of enthusiasts, some of whom founded their own businesses producing software and hardware for the ZX81, and many went on to play a major role in the British computer industry. 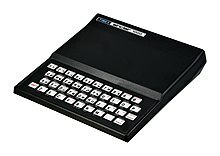 The ZX81's commercial success made Sinclair Research one of Britain's leading computer manufacturers and earned a fortune and an eventual knighthood for the company's founder Sir Clive Sinclair. The ZX81 has a base configuration of 1 KB of on-board memory that can officially be expanded externally to 16 KB. Its single circuit board is housed inside a wedge-shaped plastic case measuring 167 millimetres (6.6 in) deep by 40 millimetres (1.6 in) high. The memory is provided by either a single 4118 (1024 bit × 8) or two 2114 (1024 bit × 4) RAM chips. There are only three other onboard chips: a 3.5 MHz Z80A 8-bit microprocessor from NEC, an uncommitted logic array (ULA) chip from Ferranti, and an 8 KB ROM providing a simple BASIC interpreter. The entire machine weighs just 350 grams (12 oz). Early versions of the external RAM cartridge contain 15 KB of memory using an assortment of memory chips, while later versions contain 16 KB chips, but the lowest addressed kilobyte is disabled. The front part of the case is occupied by an integrated 40-key membrane keyboard displaying 20 graphic and 54 inverse video characters. Each key has up to five functions, accessed via the SHIFT and FUNCTION keys or depending on context. For example, the P key combines the letter P, the " character, and the BASIC commands PRINT and TAB. The ZX81 uses a standard QWERTY keyboard layout. The keyboard is mechanically very simple, consisting of 40 pressure-pad switches and 8 diodes under a plastic overlay, connected in a matrix of 8 rows and 5 columns. The ZX81's primary input/output is delivered via four sockets on the left side of the case. The machine uses an ordinary UHF television set to deliver a monochrome picture via a built-in RF modulator. It can display 24 lines of 32 characters each, and by using the selection of 2×2 block character graphics from the machine's character set offers an effective 64 × 44 pixel graphics mode, also directly addressable via BASIC using the PLOT and UNPLOT commands, leaving 2 lines free at the bottom. Two 3.5 mm jacks connect the ZX81 to the EAR (output) and MIC (input) sockets of an audio cassette recorder, enabling data to be saved or loaded. This stores each data bit as a number of pulses, with each pulse being a 150 µs 'high' then a 150 µs 'low', followed by an inter-bit silence of 1300 µs. A '0' bit consists of four pulses and a '1' bit of nine pulses. The baud rate therefore varies between 400 bps for all '0's and 250 bps for all '1's. A file with equal amounts of '0's and '1's would be stored at 307 bps (38 bytes/sec). This provides a somewhat temperamental storage medium for the machine, which has no built-in storage capabilities. The ZX81 requires 420 mA of power at 7–11 V DC, delivered via a custom 9 V Sinclair DC power supply. The ZX81's built-in RF modulator can output a video picture to either a UHF 625-line colour or monochrome television (used in the UK, Australia, and most western European countries). France required a slightly modified version of the machine to match the positive video modulation of SECAM sets, while the US and Canada required a different ULA chip and modulator to cope with their 525-line VHF (NTSC) television systems. Both the ZX81 and its predecessor, the ZX80, have a significant drawback in the way that they handle visual output. Neither machine has enough processing power to run at full speed and simultaneously maintain the screen display. On the ZX80, this means that the screen goes blank every time the machine carries out a computation and causes an irritating flicker whenever a shorter computation – such as processing a keystroke – takes place. The unexpanded ZX81's tiny memory presents a major challenge to programmers. Simply displaying a full screen takes up to 793 bytes, the system variables take up another 125 bytes, and the program, input buffer and stacks need more memory on top of that. Nonetheless, ingenious programmers are able to achieve a surprising amount with just 1 KB. One example is 1K ZX Chess by David Horne, which includes most of the rules of chess in 672 bytes. The ZX81 conserves its memory to a certain extent by representing entire BASIC commands as one-byte tokens, stored as individual "characters" in the upper reaches of the machine's unique (non-ASCII) character set. The edge connector or external interface at the rear of the ZX81 is an extension of the main printed circuit board. This provides a set of address, control, and data lines that can be used to communicate with external devices. Enthusiasts and a variety of third-party companies make use of this facility to create a wide range of add-ons for the ZX81. Clive Sinclair's first company Sinclair Radionics, established in 1962, made its name producing a wide range of cheap electronics aimed at the hobbyist market. Its products include amplifiers, radios, multimeters and other items which were generally sold in kit form to hi-fi enthusiasts and other electronics hobbyists. The company entered a new market in 1972 when it launched the first "slimline" pocket calculator, the Sinclair Executive. It was a major success that Radionics followed up by launching a wide range of pocket calculators. The company's subsequent expansion made it Europe's biggest calculator manufacturer by 1975. By the late 1970s, however, Sinclair Radionics was experiencing serious difficulties. It lost its ability to compete effectively in the calculator market following the launch of a new generation of Japanese-produced calculators with liquid crystal displays, which were much more capable and power-efficient than Sinclair's LED calculators. Projects to develop a pocket television and digital watch turned out to be expensive failures. The company made losses of more than £350,000 in 1975–76, bringing it to the edge of bankruptcy. In July 1977 Radionics was rescued by a state agency, the National Enterprise Board (NEB), which recapitalised it, provided a loan facility and took effective control of the company by acquiring a 73% stake. The launch of the ZX81 was catalysed in part by the British Broadcasting Corporation's plan to produce a TV series, to be broadcast in 1982, aimed at popularising computing and programming. The BBC intended to commission an existing manufacturer to provide it with a BBC-branded home computer to tie in with the series. When Clive Sinclair got wind of the project in December 1980, he wrote to the BBC informing them that he would be announcing a new version of the ZX80, to be called the ZX81, in early 1981. It would remedy some of the ZX80's deficiencies and would be both cheaper and more advanced. Sinclair naturally wanted the ZX81 to be a candidate for the BBC contract and lobbied for its adoption. He pointed out that there were already 40,000 users of the ZX80 and that by the time the series was broadcast there were likely to be upwards of 100,000 ZX81 users (which turned out to be an underestimate by over 400,000 – an indication of how the ZX81's success exceeded even Sinclair's expectations). The development of the ZX81 got under way even before the ZX80 had been launched. Sinclair's chief engineer, Jim Westwood, was given the task of improving the ZX80's hardware to reduce the number of components and thus bring down the cost. He also sought to fix some of the more annoying problems with the ZX80. Westwood and his colleagues found that the component count could be reduced greatly by combining eighteen of the ZX80's chips into a single uncommitted logic array (ULA), a type of general-purpose chip full of logic gates that were connected up as the customer required during chip manufacture. This short-lived technology of the day was cheaper and quicker than the design of a customised logic chip, which typically required very high volumes to recoup its development cost. Ferranti produced the new chip for Sinclair, who hailed Westwood's design as a triumph of innovation: "The ZX81 had four chips when our nearest competitor in this respect, the TRS-80, had 44." Only 70% of the logic gates on the ULA were supposed to be used, but Sinclair decided to use them all to squeeze more functions in. This resulted in the machine becoming uncomfortably warm during usage. Computing folklore held that the ZX81 had to be refrigerated by balancing a carton of cold milk on top of the case. Sinclair attributed the higher failure rate of the kits to customers breaking the components by inserting or soldering them the wrong way, though the company admitted that there was a persistent problem with power supplies that affected both kits and pre-assembled ZX81s. The bigger problem was perhaps Sinclair's lack of after-sales service, which Robin Clarke of New Scientist described as "one of the worst after-sales performance records of any company ever established." The Financial Times observed that "Clive Sinclair's offices are filled with returned computers which can take months to be repaired." The company's slowness in replacing returns and delivering freshly ordered machines meant that Sinclair Research gained a reputation for poor customer service. This tactic proved highly successful, with Sinclair announcing by March 1982 that it had sold 250,000 ZX81s worldwide. 50,000 computers were sold each month, 60% outside the UK, despite Sinclair and W. H. Smith being the only distributors. When sales fell in the wake of the launch of its successor, the ZX Spectrum, Sinclair reduced the price of the pre-assembled version to £49.95 in May 1982. It was cut by another £10 the following April. Despite the increased competition from much more capable computers, the ZX81 was still shipping in excess of 30,000 units a month even as late as July 1983, more than two years after it had been launched. By that time, according to Sinclair Research, over 1.5 million ZX81s had been sold. Selling the ZX81 over the counter was seen as something of a gamble and Rowland's colleagues were initially unenthusiastic about the scheme. Branch buyers thought that the ZX81 was unlikely to sell more than 10–15 units per branch at launch. Rowland himself thought that the ZX81 would sell about 10,000 units during the first five months of the retail agreement, equivalent to one month's mail order sales by Sinclair. In the event, the ZX81 was a massive success for Smith's, it went on sale for £99 making it the first home PC in the UK to retail for under £100. The "Computer Know-How" sections were swamped with eager customers, overwhelming the 300 staff who had been trained to demonstrate the machines; a Financial Times correspondent wrote of being "dazed and bewildered by the crowds of schoolchildren clustered round the ZX81 in your local branch of W.H. Smith." Within a year, Smith's had sold 350,000 ZX81s, making an estimated net profit of £10 million. Sales of peripherals, software, books and magazines netted even more profit. The British chain stores Boots, John Menzies and Currys began selling the ZX81 as soon as Smith's exclusive distribution deal expired and a number of companies secured overseas distribution rights for the ZX81, which was being sold in 18 countries by March 1982. Sinclair launched the ZX81 in the United States in November 1981 at a price of $149.95 assembled and $99.95 in kit form, initially selling directly to the American market by mail order. To be useful the computer needed an extra 16 KB RAM pack which cost $49.95. Sales reached 15,000 a month by January 1982, while American Express sold thousands more to its own customers. In February 1982 Timex obtained a licence from Sinclair to sell the ZX81 directly through thousands of retail outlets in the US, paying Sinclair Research a 5 per cent royalty on all Sinclair hardware and software sold by Timex. The company was later to produce its own licensed clones and variants of the ZX81. By August 1982 Sinclair had lowered the American mail-order price of the assembled ZX81 to $99.95 and kit to $79.95, and its advertisements stated that "more than 10,000 are sold every week". In December 1981 Mitsui obtained rights to distribute the ZX81 in Japan, selling it by mail order for ¥38,700 (equivalent to £83 in 1982 prices), and had sold 5,000 units by July 1982. The Japanese market's favourable reaction to the ZX81 led Mitsui to begin selling the ZX81 over the counter in large bookshops from September 1982, with annual sales of 20,000 units predicted. In the Netherlands, the regular Sinclair ZX81 was for sale as well as a Bang & Olufsen branded version called Beocomp. The success of the ZX81 led almost immediately to enthusiasts producing a huge variety of peripherals and software. Clive Sinclair was "amused and gratified" by the attention the machine received but other than what Clarke described as "a few remarkably poor programs on cassette" made little effort to exploit the demand, effectively ceding a very lucrative market to third party suppliers, a decision that undoubtedly forfeited a lot of potential earnings. W.H. Smith, for instance, was able to exploit a peculiarity of the ZX81; owners found that technically obsolete low-fidelity mono tape cassette recorders worked better as storage devices than higher-quality music systems. Smith's purchased cheap "shoebox" cassette recorders in the Far East and sold them with the W.H. Smiths logo as "data recorders". Over 100,000 were sold in 18 months. Sinclair released only two official peripherals for the ZX81, a 16 KB RAM pack (actually the same one previously released for the ZX80, but rebadged) and the ZX Printer, both of which plugged into the edge connector at the rear of the ZX81. They retailed at a launch price of £49.95 each but both had notable flaws. The RAM pack was top-heavy and was supported only by the edge connector. It had a habit of falling out of its socket at crucial points and crashing the ZX81, losing anything that the user had typed in. Users turned to using sticky lumps of chewing gum, double-sided tape or Blu-Tack to cure what became known as the "RAM pack wobble" problem. The ZX Printer was a tiny spark printer that used two electrically charged styli to burn away the surface of aluminium-coated paper to reveal the black underlay. It worked reasonably well at first but its output deteriorated rapidly after a time. Sinclair's licensing agreement with Timex enabled the American company to produce three clones or offshoots of Sinclair machines for the US market. These were the Timex Sinclair 1000, Timex Sinclair 1500 (both variants of the ZX81) and the Timex Sinclair 2068 (a variant of the ZX Spectrum). The TS1000 was launched in July 1982 and sparked a massive surge of interest; at one point, the Timex phoneline was receiving over 5,000 calls an hour, 50,000 a week, inquiring about the machine or about microcomputers in general. It was virtually identical to the ZX81 save for re-branding and the addition of an extra 1 KB of memory, totalling 2 KB. In the five months following the TS1000's launch, the company sold 550,000 machines, earning Sinclair over $1.2 million in royalties. Some companies outside the US and UK produced their own "pirate" versions of the ZX81 and Timex Sinclair computers, aided by weak intellectual property laws in their countries of origin. Several Brazilian companies produced ZX81 clones, notably the TK series (such as the TK85) from Microdigital Eletronica of Brazil) and Prológica's CP-200. Czerweny Electrónica of Argentina produced the CZ1000 and CZ1500, clones of the ZX81 and TS1500 respectively. Lambda Electronics of Hong Kong produced the Lambda 3000, based on the ZX81, which was itself widely copied by other Chinese manufacturers. New hardware and software continue to be developed for the ZX81, including a ZX81-based webserver; the ZXpand, a combined SD card interface, 32K configurable memory expansion, and optional joystick port and AY sound interface; and new games on cassette tape by Revival Studios, such as Avalanche, Mayhem, Down, Stairrunner and more. ^ a b "Sinclair ZX81 Data Tapes". ^ Thomasson 1983, p. 40. ^ a b Thomasson 1983, p. 14. ^ New Scientist (7 February 1980). ^ For comparisons of processing speed in the two modes, see "ZX81 v IBM PC", Which Micro?, April 1983, p. 36. ^ Thomasson 1983, p. 13. ^ Thomasson 1983, p. 26. ^ Horne, David (February 1983). "Full ZX-81 Chess in 1K". Your Computer. pp. 100–102. Retrieved 5 March 2018. ^ a b Nash 1984, p. 102. ^ Thomasson 1983, p. 43. ^ Dale 1985, p. 39. ^ Adamson & Kennedy 1986, p. 31. ^ a b Adamson & Kennedy 1986, p. 35. ^ Adamson & Kennedy 1986, p. 36. ^ Adamson & Kennedy 1986, p. 39. ^ Adamson & Kennedy 1986, p. 65. ^ Adamson & Kennedy 1986, p. 66. ^ Adamson & Kennedy 1986, p. 68. ^ Adamson & Kennedy 1986, p. 86. ^ Valéry, Nicholas (19 May 1977). "Spare a byte for the family". New Scientist. pp. 405–406. Retrieved 25 January 2015. ^ a b Dale 1985, p. 95. ^ Adamson & Kennedy 1986, p. 80. ^ Adamson & Kennedy 1986, p. 81. ^ Adamson & Kennedy 1986, p. 61. ^ Adamson & Kennedy 1986, p. 90. ^ Dale 1985, p. 97. ^ Dale 1985, p. 102. ^ Adamson & Kennedy 1986, p. 256. ^ Dale 1985, p. 100. ^ Dale 1985, p. 103. ^ Dale 1985, p. 104. ^ Adamson & Kennedy 1985, p. 104. ^ Adamson & Kennedy 1985, p. 116-117. ^ Dale 1985, p. 106-7. ^ Campbell, Robert (14 July 1983). "New clothes for IT in schools". New Scientist. p. 133. Retrieved 26 January 2015. ^ Adamson & Kennedy 1986, p. 103. ^ a b Adamson & Kennedy 1986, p. 104. ^ Adamson & Kennedy 1986, p. 89-90. ^ Adamson & Kennedy 1986, p. 105. ^ Adamson & Kennedy 1986, p. 107-8. ^ Adamson & Kennedy 1986, p. 106. ^ Laing 2004, p. 61. ^ a b Adamson & Kennedy 1986, p. 94. ^ a b c Adamson & Kennedy 1986, p. 111. ^ a b c Adamson & Kennedy 1986, p. 112. ^ Adamson & Kennedy 1986, p. 133. ^ Adamson & Kennedy 1986, p. 108. ^ a b Adamson & Kennedy 1986, p. 97. ^ Adamson & Kennedy 1986, p. 99. ^ Adamson & Kennedy 1986, p. 21. ^ Adamson & Kennedy 1986, p. 22. ^ Adamson & Kennedy 1986, p. 98. ^ Adamson & Kennedy 1986, p. 114. ^ Adamson & Kennedy 1986, p. 143. ^ a b "Toy-like but a best seller". The Age. 9 March 1982. p. 33. Retrieved 16 March 2014. ^ Adamson & Kennedy 1986, p. 259. ^ a b Adamson & Kennedy 1986, p. 109. ^ Adamson & Kennedy 1986, p. 257. ^ Adamson & Kennedy 1986, p. 108-9. ^ Advertisement (August 1982). "The $99.95 Personal Computer". BYTE. pp. 82–83. Retrieved 19 October 2013. ^ "The Home Computer Museum". ^ Garrett, Billy (January 1983). "The Timex/Sinclair 1000". BYTE. p. 372. Retrieved 19 October 2013. ^ Adamson & Kennedy 1986, p. 96. ^ Adamson & Kennedy 1986, p. 107. ^ Advertisement (June 1982). "Explore the excellence of your ZX81 with a Memopak". BYTE. p. 335. Retrieved 19 October 2013. ^ Dale 1985, p. 108. ^ "The 8th ZX Microfair Showguide". Retrogames. Retrieved 23 February 2014. ^ Morris 1986, p. 20. ^ Bridgewater 1998, p. 156-157. ^ a b Adamson & Kennedy 1986, p. 121. ^ Adamson & Kennedy 1986, p. 134. ^ Adamson & Kennedy 1986, p. 140. ^ a b Adamson & Kennedy 1986, p. 135. ^ Adamson & Kennedy 1986, p. 137. ^ Adamson & Kennedy 1986, p. 136. ^ Green, Wayne (November 1983). "Hot Cider". inCider. p. 6. Retrieved 7 January 2015. ^ Adamson & Kennedy 1986, p. 141. ^ Bradbeer, Robin (March 1983). "Timex upgrades Spectrum". Sinclair User. pp. 83–84. Retrieved 28 January 2015. ^ "Send in the clones". AlchNews (33). Alchemist Research. 2000. ^ Adamson & Kennedy 1986, p. 119. ^ "The Sinclair ZX81 Home Computer". www.rwapsoftware.co.uk. Retrieved 5 March 2018. Adamson, Ian; Kennedy, Richard (1986). Sinclair and the Sunrise Technology. Harmondsworth, England: Penguin Books Ltd. ISBN 978-0-14-008774-1. Dale, Rodney (1985). The Sinclair Story. London: Gerald Duckworth & Co. ISBN 978-0-7156-1901-8. Thomasson, Don (1983). The Ins and Outs of the Timex TS1000 & ZX81. Leighton Buzzard, England: Melbourne House. ISBN 978-0-86161-118-8. Gillies-Jones, Ray (22 June 2000). "Remember ZX80, ZX81, ZX Spectrum". Computer Weekly. Archived from the original on 11 October 2012. Hartnell, Tim (June – July 1981). "Review – The Sinclair ZX81". Your Computer. pp. 12–14. Hartnell, Tim (November 1981). "WH Smith brings ZX-81s to the high street". Your Computer. p. 37. Archived from the original on 2 December 2012. Scot, Duncan (August – September 1981). "Interview: Clive Sinclair". Your Computer. pp. 21–22. This page was last edited on 18 February 2019, at 21:40 (UTC).